Few organisations have the necessary organisational culture to deliver truly customer-centric customer experiences. Often, a well-intentioned strategy is diluted by operational constraints (whether real or perceived) and a loss of focus, resulting in little more than lip-service being paid to the concept of customer-centricity. Too many organisations focus on trying to deliver ‘world class’ service – rather than giving customers what they actually want, which in most cases is a quick and easy process to follow, that is right first time. There is a disconnect between strategy and vision, and the operational staff and the behaviours that are required to really deliver the customer experience. In our experience, this is usually caused by siloed business units, misaligned reward and recognition packages, and a lack of executive buy-in. Regulatory or other enforced processes are used as an excuse to provide poor customer experiences without considering other experience based principles that can be used to manage and improve the customer experience. Traditional customer feedback is often reviewed days and weeks following the actual event. Digital and online social platforms such as Twitter, Facebook and Blogs are enabling mass feedback to be captured in real-time, and distributed across the business to those responsible to action immediately. Often, non customer-facing business units form the greatest obstacle in preventing a company from becoming truly customer-centric. Organisations often over-focus on the frontline service delivery teams, and do not focus on creating the required mindsets, behaviours and processes, within the back and head-office teams. What distinguishes customer-centric organisations from other companies that proclaim their customer focus? In short, they’ve moved beyond lip service and re-orientated their entire operating model around the customer, increasing customer satisfaction and their own profitability in the process. Customer-centric companies understand not only what the customer values, but also the value the customer represents to their bottom line. They align their operating models behind a carefully defined and quantified customer segmentation strategy and tailor the business – product/service development, demand generation, production and scheduling, supply chain, customer care, etc – to delivering the greatest value to the best customers for the least cost. Each of these areas are discussed in detail in the following sections of this document. Having clear leadership from the top that articulates what customer-centricity means to your business, and what it looks like in practice, is critical to creating a customer-centric organisation. Whilst it is common to have someone responsible for the customer experience, organisations that are truly focused on building their business around their customers are empowering top executives to own the customer journey, from initial contact through to final resolution. within the customer lifecycle. A key challenge that many organisations face is how to change service accountability from product driven or silo based views of the customer, and move the customer service activity towards common, shared experience-based indicators. Enabling this change is fundamental to driving the right behaviours. senior levels to help facilitate and drive some of these changes. The CCO role is typically responsible for providing a single vision across all methods of customer contact and is often responsible for influencing business units both in the front and back office with the purpose of promoting the customers agenda. It is common for these roles to report the Chief Executive Officer (CEO) and in many instances the CCO is a member of the board. Successful Customer Service Leaders throughout the organisation must also have the ability to build strong relationships with key areas of the business that impact the customer experience. Often this means playing the role of peacemaker and teacher, to educate other business functions, such as IT and HR, about the impact that changes in other business functions have on the customer. High-level governance and lower level, cross-function working groups and relationships are fundamental to driving positive customer experiences. Often starting with new projects, success will come through embedding these behaviours into ongoing daily activities. As customers have changed the way they interact with organisations and moved towards digital channels (Facebook, Twitter, Blogs etc..) It is essential that customer service leaders are seen to have a voice and presence through these digital channels. The ability to communicate and engage via short and direct messages is a powerful tool that allow customers and employees to keep up to date without having to spend large amounts of time searching, reading documents or listening to presentations. Steve Jobs regularly used You Tube to make special announcements to Apple staff and customers, proving far more successful and engaging than the traditional methods such as mass email, by creating a more personal approach. Some organisations have built large social networks that allow employees to communicate and engage with each other via digital channels allowing real-time engagement and communication not possible in traditional channels. An emerging trend we are seeing is CEOs and other senior executives taking the time to respond personally to customer complaints and feedback via these same digital channels. a clear view of customer feedback and complaints insights along with the key metrics. Some of the more traditional and informal methods of communication are often over looked. ‘Water-cooler’ conversations whereby senior executives relay real stories of employees delivering exceptional customer service, are a simple yet extremely effective way to show awareness from the top of what’s happening and the frontline. These scenarios can provide motivation and inspiration for employees to provide the same level of service. all areas of the organisation to better understand the customer. Many organisations report positive results, albeit incremental, rather than transformational change. In order to fully capitalise on these programmes companies need to leverage their data/insights to drive decision making. a valid insight into their spending profile and habits. Analysis can often lead to breakthroughs in the services and products you choose to offer customers and how you choose to interact with them. or a family can drastically alter the results. For an organisation to achieve the outcome best suited to them, the approach they take to identifying their customers is crucial. The approach should be monitored and adapted in line with an organisation’s customer service strategy to provide different views of the customer base. Many organisations lack depth in their customer insight. The ability to identify variances in customer profiles unlocks a wealth of information with which to target them. Understanding the different socio economic groups, preferences, habits, purchasing pattern etc., can help organisations approach customer service in a way that is much more useful to the customer. Above all, it is vital to communicate these insights across the organisation, especially to areas that typically would not consider customer insight as part of both operational and strategic change. The customer perception of a brand is based on what they see, hear and sense. These initial impressions need to be backed by empowered employees and business processes that minimise customer effort. This perception often starts with the brand. The brand is the essence of the underlying perception that your customers have of an organisation. Often there is a significant disconnect of the delivery of this brand between Sales and Marketing and Customer Care. Part of embedding the brand, and key to managing customer expectations is having a defined end-to-end customer experience. This enables the key interaction touch-points across every channel to be identified and understood. Key to understanding these touch-points is taking a holistic approach and incorporating every aspect involved. Once these touch-points are understood, they can be designed to specify exactly what you want the customer to perceive at each touch-point. Often this means creating cost-effective processes where the customer may perceive a seamless experience, but which may rely on manual processes to fulfill it. This process should also encompass emerging digital and mobile customer interaction channels such as Facebook, Twitter and smartphone applications. The change in how consumers are choosing to interact with organisations and the speed at which it is happening, has established these types of contact channels as real channels that customers expect organisations to be able to interact with them on. Many organisations fail to do this in a clear and concise manner. The majority of customers do not want amazing service, instead they want clear and accurate information on the service they will receive. Customers simply want an efficient, friendly experience that resolves their enquiry. However, there are key moments in a customer’s lifecycle where delivery of outstanding service will influence their long-term perceptions and behaviours (otherwise known as ‘moments of truth’). One way organisations are achieving this is through changing the behaviour of employees around a limited number of key customer interaction touch points that are most critical to providing competitive differentiation. Through targeting people centric change at key events, specific behaviours and actions can be identified and then taught and communicated to employees who are responsible for delivering it. to have service promises or customer charters, which outline what customers can expect. Each promise needs a clear metric to measure against and senior executives must be accountable for delivery of them across the organisation. Organisations need to create events and themes around these promises to keep them relevant, refreshed and top-of-mind. To empower the frontline, the brand and its implications need to be understood. Providing empowerment to the frontline works best when people believe they are an important part of the organisation. Senior management need to regularly show their appreciation of the role people play on the frontline and acknowledge the feedback they provide as well as leading by example. It is the frontline staff who understand better than most the impact that specific changes will have on both their roles and on the customer. Ensuring that your frontline team understands how you want to treat customers and the style of relationship you want your customers to experience will impact how they behave, the sorts of decisions they make and ultimately will form the view that the customer has of the organisation. at first point of contact. Traditionally, processes have been built around scripts and measurement frameworks that are designed to deliver conformity. However, experience has told us that this can lead to unhappy customers when their needs do not fit the script. Some organisations have gone to the other extreme and provide ambiguous or unclear frameworks which increase the risk factor, particularly around customer identification and verification processes. can do to empower the frontline is provide a Single Customer View (SCV) of all customer interactions, relationships and external activity. It is essential that a realistic customer journey roadmap is built to show how the SCV continuously evolves to provide greater insight and functionality right across the business. Creating a culture of innovation, with individual customer focus and responsibility, underpinned by an embedded customer service framework, is vital to establishing effective and high performing staff. This environment captures individual creativity without increasing risk for frontline staff. To achieve this there needs to be buy in from staff for core values to drive the right behaviours and allow them to approach service in a way that is comfortable to them. Creating an environment where individuals feel they have a degree of creativity and empowerment within a structured framework allows for ‘Magic moments’ of customer service. These are unexpected moments that go beyond the norm of customer service and provide truly unique experiences. The design and delivery of the customer experience should be the key strand that brings an organisation together and closer to customer-centricity. Unfortunately, we often find that the majority of people outside customer-facing business units fail to understand the customer journey and touch-points from the customer’s perspective. An approach that some organisations take is to use the customer journey and the mapping of the key customer touch-points as the framework to educate and help drive customer-centric thinking and behaviours within back office functions. Product and Service proposition development teams need to foster close working relationships with contact centres and retail stores to encourage effective input and feedback from those who have real experience of the impact that specific changes will have on both their roles and the customer. Within HR simple things like creating the flexibility to allow contact centre colleagues to ‘bank’ time that they spend working after their shift has ended to resolve a customer enquiry, can make a big difference to morale and focus on the customer. Our belief is that organisations must take a more robust view of these non customer-facing business functions and provide them with the education, tools and awareness needed to inform individuals of what it means to be a customer or customer facing. Many organisations have overcome some of these challenges by encouraging/mandating other areas of the business and senior executives to spend time on the frontline to get a real perspective of the customer experience. Often this leads to a new appreciation of the impact of decisions made in key functions, such as Marketing, IT and HR. The right metrics also need to be supported with the right framework. However, putting in place a robust measurement system alone is not sufficient; the key is to understand what this measurement is telling you and to act upon it to change how the business operates. This will help foster a culture of continuous improvement. This must be an ongoing journey, one of listening, understanding and responding (where appropriate). There needs to be a single headline customer metric, which is understood and used across the business. Often this is built around net customer gain or loss and fiscal impact for the senior executive level. Supporting these figures, typically the headline complaint figures and customer insight trends will be used to provide context. Metrics need to be aligned to the customer journey and key touch-points. This helps to create experience-based accountability rather than product or business unit focus points, which often conflict against customers’ needs. Many organisations employ Net Promoter Score (NPS) and more commonly Customer Lifetime Value (CLV) as key metrics. can respond to, both online and, where appropriate, to ‘surprise’ employees face-to-face simply by saying ‘great job’. voice of the customer campaigns that proactively seek customer opinion and indirect feedback which includes social media in the form of Facebook, Twitter, blogs and online forums. facing and non customer-facing business units), or joined-up to allow consolidated analysis and action. Experience shows that where isolated feedback loops exist, the output is often never seen at the right level or in the right area of the business to implement effective change. To create effective feedback loops, all feedback must be consolidated against the customer journey and key touch-points. This is often best done centrally and driven out of a Voice of Customer (VoC) team that is taking a customer view, rather than thinking about specific product or channel silos. a full-page national newspapers advert or television commercial. Organisations are approaching the digital age in very different ways. Some have dedicated teams monitoring and responding to individual feedback, while others are choosing to monitor but not take direct action. However, for instances involving urgent customer updates such as product issues, the speed and breadth of delivery via social media makes it the channel of choice. Many organisations use data mining tools and search capabilities to hunt out comments and feedback made by individuals about their company. Gaining feedback through traditional methods usually only provides a view of the success of a campaign a considerable time after it has finished. Social media provides organisations with real-time insight. Organisations have an opportunity to make changes then and there and directly influence the success of new products or services. In order to leverage these new digital channels and respond to customers in a timeframe to make a real difference, organisations need to have a framework in place. Developing a robust process considering all aspects of data protection and legalities is imperative to managing the risk involved in a new channel. to submit, track and monitor feedback and ideas submitted. So, how can you take the key areas we have outlined above and make them work for you? Unfortunately there are no simple answers or ‘big-bang’ solutions. The approach you take will depend on your organisation’s history, workforce, future strategy and the current maturity of your relationship towards the customer. 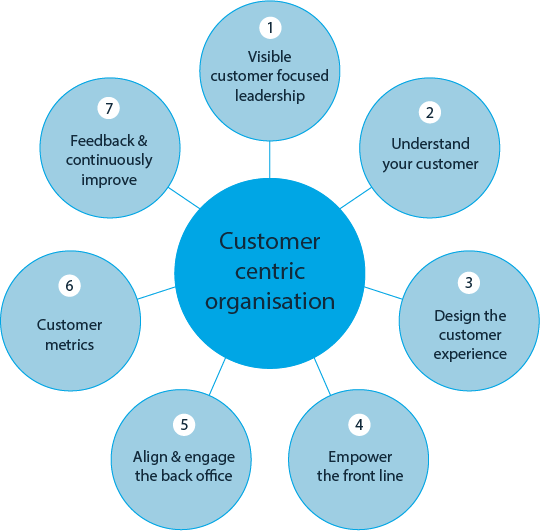 Understand the maturity level of customer-centricity within your organisation. Understand and document the end-to-end customer journey and key customer experience touch-points. Complete a ‘deep-dive’ analysis and design of a small number of experience touch-points that have the most influence over your customers’ perception of your business. Develop both short and long-term change agendas that are focused on achieving real improvements in customer outcomes. 1. Understand the maturity and level of customer-centricity within your organisation. By assessing and measuring your approach to customer-centricity at all levels of your organisation, you can evaluate whether you have fully implanted customer management within your DNA. The results will provide you with a platform for undertaking improvements, using the wide range of levers discussed in this paper. 2. Understand and document the end-to-end customer journey and customer experience touch-points. and understood by teams across the organisation. 3. Complete a ‘deep-dive’ analysis and design of key experience touch-points that have the most influence over your customers’ perceptions. to view the opportunities and challenges through different lenses, independently of any business unit or channel silos. 4. Develop both short-term and long-term change agendas that are focused on achieving real improvements in customer outcomes. A plan with both short-term and long-term goals should be developed in order to deliver tangible improvements to both the customer and colleague experience. Each initiative requires clear metrics to define success as well as accountability to deliver and maintain the desired change. In our experience, organisations often put too much focus on customer-facing initiatives when the problem stems from a back-office process or behaviour that is not identified or understood. The continued evolution of customer expectations and behaviours towards digital and anytime-anywhere service is only going to accelerate as the world becomes more collaborative and technology-enabled. Therefore, in responding to these changes, organisations must always put themselves in the shoes of their customers when designing and delivering interactions to ensure that they minimise customer effort and maximise customer value. The evolution towards becoming a truly customer-centric organisation is both complex and long, and rightly so. It is the holy grail of unlocking the true potential of customer value. Yet organisations should not be discouraged. There are a number of initiatives that can be driven from Customer Service Leaders to change the composition of the organisational structure at all levels. Furthermore, our experience has shown that even small changes can have significant benefits for both employees and customers. Incremental changes in policy and processes to demonstrate a shift in thinking and behaviour can help to drive transformational change agendas. However, Customer Service Leaders need to be smart about how to approach customer-centric change to ensure the greatest return on investment. Often the return is not easily quantified and leaders must have the courage to stand up for the customer and drive through compelling initiatives that may not return in-year benefits but which will deliver an efficient platform for achieving long-term customer value.